The Marist men’s basketball team has not finished the season with a winning record since the 2007-2008 season when they went 18-14. Despite losing their first game of the season the Red Foxes showed that they are a competitive team ready to take Marist back into the hunt and continue the success of new Head Coach Mike Maker. Coach Maker is known for his winning and with him taking over the team here is a list of things to look for during the 2014-2015 season. Although Marist lost their first game to Bucknell 75-72, red-shirt sophomore Hart had a great game scoring a career-high 33 points. Last year he averaged 14.7 points a game under Coach Jeff Bower. Hart is really taking control of the team after winning the MAAC Rookie of the Year last season. He is a very exciting player offensively and plans on focusing more on defense this year to become a threat on both sides of the ball. As the season progresses people should watch what Hart does on the court to help lead the Red Foxes to a winning season. 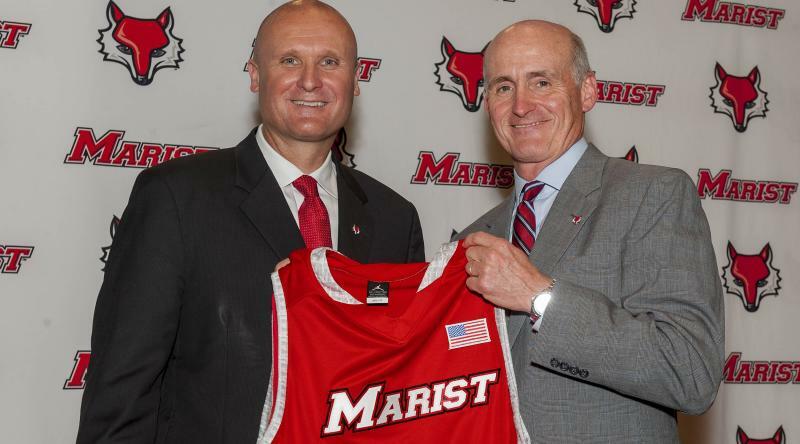 Head Coach Mike Maker is in his first season with Marist after spending six years at Williams College. While there he had a record of 147-32 and made it on College Insiders list of the top 25 non Division-1 head coaches. “He’s a really gifted coach. He’s a teacher, and players will develop and get better. He’s someone that I think is very professional, and people at the school will enjoy working with him” said Oregon Head Coach Dana Altman who was assisted by Coach Maker during his time at Creighton. Maker is excited to be at the Divison-1 level and the players are excited to have him. “There’s been receptiveness to the new coaching style. “The whole coaching staff has been great, being demanding with us and bonding with us and creating trust from us” said senior Chavaughn Lewis who is the 7th all-time scorer in Marist history. Lewis is the 7th all-time scores in Marist history and is 537 points away from being first. Lewis is a senior and Maker is happy to have him on his team. “When you look at our senior class, certainly Chavaughn Lewis is an All-MAAC player. I’ve been totally impressed with his ability, his toughness, his competitiveness. He’s lightning in a bottle” said Maker. “We feel so blessed to have him. I wish I had him for more than one year” he added. Being a senior Lewis is ready to win “I’m just ready to get out after it with those guys” he said, with those guys referencing his teammates. While 537 points is no easy feat, with another great season it is possible for Chavaughn Lewis to become Marist’s all-time leading point scorer after having 544 points last season. Marist’s home opener is this Saturday, November 22nd, against Army at 7 p.m. The first 1,000 students to attend will receive a free Marist T-Shirt. Make sure to watch Hart and Lewis as they are looking to be a top five team under Coach Maker in what is sure to be an exciting season. This entry was posted in Sports and tagged #Marist, basketball, sports. Bookmark the permalink.